The swearing in of U.S. President Barack Obama and the other presidential inauguration activities generated massive Web traffic Tuesday, leading to site slowdowns but not to a general meltdown of the Internet. With intense and widespread interest in the ceremonies and festivities, especially President Obama's oath of office and inaugural address, millions of people had been expected to tune in online, especially those without TV access while at work. Big media, news and U.S. government sites streamed events live and prepared special sections for the inauguration, yet some were still caught off-guard and experienced performance problems, mostly between midmorning and 12:30 p.m. U.S. Eastern Time. Among those experiencing significant slowdowns were the sites of ABC, CBS, Fox Business, the L.A. Times, NBC, National Public Radio, USA Today and The Wall Street Journal, according to Keynote Systems, an Internet measurement and testing company. Government sites that buckled under the traffic included those of the White House (promptly updated by the new administration), the U.S. Senate and the National Park Service, according to Keynote. Gomez, another Web performance-tracking company, also noticed a performance problem at the National Public Radio Web site. "We predicted today would be one of the most, if not the most, significant online streaming event[s]," said Shawn White, Keynote's director of external operations. "This was an unprecedented online event. I don't think we've ever seen as many viewers go online to watch an event," he added. "It's difficult to prepare for something that's unprecedented." "On a positive note, I had heard predictions that the Internet would crumble, which didn't happen," White said. A group of 40 large Web sites that Keynote routinely tracks also saw, on average, a collective slowdown during the swearing-in ceremony and the inaugural address, likely caused by the demand placed on Internet bandwidth by millions of live video streams, White said. Interest in Tuesday's events was fueled by a combination of factors. 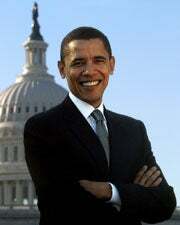 President Obama is the country's first African-American president. In addition, he comes into office trailed by widespread hope that he'll fix the country's economic crisis. This inauguration was the first since online video became a mainstream activity, so it wasn't a surprise that TV networks like CNN and MSNBC, as well as major newspapers like The New York Times and The Washington Post, provided live broadcasts on their sites. CNN, which began its Web broadcast at 8 a.m., partnered with Facebook to display "status updates" from members of the social-networking site as they reacted to the events. According to Facebook, by 1:15 p.m., 600,000 status updates had been posted on CNN.com Live, with 8,500 hitting at the minute President Obama began his speech. CNN.com, which will stream live video until the last inaugural ball ends, had, as of 3:30 p.m., generated more than 136 million page views, and its CNN.com Live section had served up more than 21.3 million live video streams globally, setting a new daily streaming record for itself, a spokeswoman said via e-mail. CNN.com Live estimates it served more than 1.3 million concurrent live streams during its peak immediately prior to President Obama's inaugural address, she said. CNN also partnered with Microsoft to generate Photosynth images from photos sent by inauguration attendees. Also breaking its own record for live streams was NBC's Hulu.com video site, the company said. Content delivery specialist Akamai reported delivering record streams and content to its customer sites, such as The New York Times, Viacom and The Wall Street Journal. Akamai delivered a peak of more than 7 million simultaneous streams, most of them live, over its EdgePlatform, at approximately 12:15 p.m., at which time total traffic on its network surpassed more than 2 terabits per second. Akamai's Net Usage Index for News, a daily Web traffic report of aggregate total visitors per minute to more than 100 news sites, recorded more than 5.4 million visitors per minute at approximately 11:45 a.m.
Other inauguration day sections could be found in Google's YouTube video sharing site, Yahoo's Flickr photo sharing site, and Apple's iTunes. The Twitter microblogging service partnered with Al Gore's Internet TV company Current TV to display messages from Twitter members online and on TV during the inauguration. In addition to video and news articles, sites often provided other features like photo slide shows, interactive maps, opinion polls, reader comment forums and timelines. Many TV stations and Web sites began tracking President Obama and First Lady Michelle Obama when they emerged at around 8:30 a.m. from Blair House, their temporary Washington, D.C. residence, and headed to a prayer service at a nearby church. After the one-hour church service, the Obamas were driven to the White House for coffee with now-former President George W. Bush and his wife, Laura Bush. All four arrived at the Capitol for the inauguration ceremony at around 11 a.m.
President Obama was sworn in shortly after noon and wrapped up his speech at around 12:30 p.m. A lunch at the Capitol and a parade to the White House followed, and the festivities will continue into the night.